Finding a suitable health insurance policy is akin to finding a needle in a haystack. There are 21 health insurance companies in India and many offer more than one type of health insurance product. Joining the bandwagon are life insurance companies who are now offering health insurance policies as well! So how do you buy one? First, make sure you know what you need – whether it is an individual health insurance or a family floater you are seeking; how much cover you need and when you need it. How do I go about buying a health insurance policy? Traditionally, health insurance policies have been bought either because they were sold or because of awareness among investors through advertisements. And a majority of us rely on the group health insurance cover provided by our employers anyway. The simplest way to go about buying a policy is to get in touch with the insurers and ask for premium rates. But this has its own limitation – you could easily take a month to get all the details and the insurance agent could really be slow in his response – after all it’s a health insurance policy he is selling and it fetches him less commission! Go online : Another easy way is to use insurance comparison sites or aggregators as they are called. Aggregators provide a single window to compare quotes and features from multiple insurance companies and help a customer select the most suitable one. There is a whole lot that have mushroomed in India of late. The best health insurance aggregator website in our opinion is Coverfox.com who gives you the results in a decent interface. How do aggregator sites work? Once online, all you need to do is provide your age, how much coverage you need and for how long – typically this is one year with most insurers today. The portal will collect personal information – email id, city and phone number to reach out to you later on – do provide this if you are a serious buyer. Suppose you are 30 years old and need health insurance for Rs 3, 00,000/- for a year. 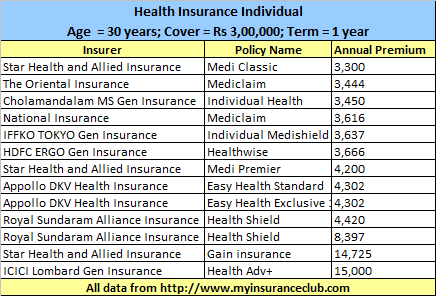 The following is a sample of the health insurance covers that are on offer. Let’s just talk about individual health insurance plans for now. Imagine the time you would have spent on collecting this data and comparing it if you were to do this offline. How do you select what you want to buy? Remember that the aggregator site provides you comprehensive information on each policy and even lets you compare them – some sites will allow you to compare two policies at a time while others will allow you to compare more. The comparison feature compares side by side almost everything an insured would want from a health policy – this way an aggregator site is very powerful to help you decide which policy scores better. After you have compared and selected your policies, all you need to do is apply the same filtering techniques one would use when buying a policy offline to select the best one that you will finally buy. There are a host of parameters that one could apply. In the example above, with so many policies available with such a wide range of premiums, a best practice could be to pick a policy with the highest, lowest and midway premiums for comparison and then apply the filtering parameters. We apply two of the most important comparison parameters first. Firstly, start with the maximum renewal age as the first option – select the insurer which allows you to renew the policy till maximum age. If you want to change to a new insurer at an advancing age, this will be looked at as a new policy and will come with a higher premium. It’s best to stick to a policy which can be renewed till the maximum age. Secondly, check when all the insurers will allow pre-existing illnesses to be covered. The earlier they start covering all pre-existing illnesses, the better. Usually there is a waiting period of a couple of years before which expense incurred on pre-existing illnesses start getting covered. The waiting period varies from company to company. Filter more by checking on what are the special features that are on offer and go through the exclusions with a comb. Exclusions are most important as far as a health policy is concerned – you don’t want to get a claim rejected because you did not know what was not included in the policy. Does the policy cover maternity expenses or ambulance expenses? Generally, there will be sub-limits for many of the expenses within the overall limit, for eg, room rent could be 1.5% of sum insured per day. So if you are staying in expensive cities like Mumbai or Delhi, for a cover of Rs 3,00,000/- the room rent charges come to Rs 4500/- per day. Think whether the hospital you want to go to will have a room that can be accommodated in this range. If not, you would be better of settling with a no sub-limit policy. Its worth noting that most of the policies will cover expenses incurred a month before and 60 or 90 days after hospitalization; free annual health check claims and a 24 hour helpdesk among a host of other common services which generally should not be used as key comparison parameters. Here is how the data looks like in our example for the highest, lowest and mid-way premium figures. Which one would you buy from the above? Its clear that the first policy is better as pre-existing illness are covered from the third year onwards and there are no sub-limits on room rent and doctor fees – so if this meets your criteria, go for it irrespective of what the premium is. After having selected a policy that suits you best, all the aggregator sites are pretty friendly in terms of helping you check out to buy the policy online after you have registered with them. The insurance company will contact you for paperwork within a week of payment. Firstly, there are many aggregator sites available in India. Not each one will cover all the 21 insurers and you could lose out on some of them. The best way around this is to use maybe 2 or 3 of them and compare and buy from one that best suits your requirement. Some aggregator sites might not have the correct data! Its best to re-check the details of the policy you have finalized with the insurer, either on the insurer’s website or offline at a local office, before buying. You still need to undergo medical tests if you are 45 years of age. Advantages of buying online ? “For starters, buying online has now become a very simple process. You do not have to go through the hassle of going through an agent, who would have a tie-up with limited number of insurance companies and may not be able to get the product that you want. The agent may try pushing a product which they want you to buy. Also, there is complete transparency in the process when you buy online – everything is there in front of you and then you can make a decision. With an agent you really do not know if some facts are being hidden and only the good part of the policy is being highlighted to you. You realize the worst when the policy document comes to you or when you start the claim process. Having said that, if the agent is a completely trustworthy person, buying online and offline are the same,” says Deepak. You save time – everything can be done at the click of a mouse. It’s cheap, you save the costs for the insurer. This is passed onto you. You don’t have to make a trip to the insurer’s offices and wait for time from the agents. Most of the aggregator sites are easy to use and compare – it’s a one stop shop to buy policies. Most of these sites are safe to operate and buy a policy using card details. Most aggregators have a FAQ section and “ask an expert” section which helps you reach out on queries you might have. Ask insurers for premium rates or dig the figures out for yourself on aggregator sites. Do not base your decision on the premium alone – remember, the policy with the cheapest premium might not be the best one for you. Also, there is no one policy that can be termed as best for everyone. Select one that meets your criteria, lifestyle and family requirements and buy it irrespective of what the premium is. If you live in a metro, take a cover of 4-5 lakhs; in a smaller city, 2-3 lakhs of cover will do. Check whether your policy will guarantee long term insurability. Check whether a floater plan is more beneficial for you. Most importantly, check the policy wordings on what the exclusions mean to you. Opt for a cashless plan. Take health insurance even if you have one from your employer. Reveal all your family illness history; if you hide anything, it will only come back to hurt you. Buy from a health insurance and not from a life insurance company. Buy a critical illness policy separately than as a rider to your basic health insurance. Disclaimer: The views and analysis expressed are those of the author and should not be construed in any way to be the sole reason of buying a policy online. Please do adequate research yourself before buying. 1. If I bought a policy online, lets say through CoverFox or PolicyBazaar or BankBazaar, would I get help when it comes to insurance claims/reimbursements just like an agent does? Or do the advice/help stop after buying the health insurance? 2. I have health cover provided through my company which included my mother. So when mom was hospitalized in a different city, I had to fillup the claim form myself & make reimbursement claims directly at the TPA. Although I can’t say it was a breeze, it wasn’t too tough either. Question is, after retirement, when I use my individual health plan, is the experience going to be very different? Do the TPA/insurance companies make life much harder for individuals unlike when we are under group insurance plans? What are your experiences? Thanks Manish, Dhawal, Pattu. Gone through lots of communication here. I’m also looking forward to buy a health insurance policy for 2Adults + 1 kid. Are there any policies which allowed monthly payment modes? In that way I’ll go for bigger coverage amount. Please let me know. PSU is preferred, but any good private sector plan will also do. I think monthly payment is generally not allowed by most of the companies because it would come to a very small amount. I think Religare, L&T has come up with some innovative plans and features. United is one PSU which you can explore. we have many Life insurance and Non-life insurance products. For you, it may be difficult to choose the best product that meet your requirements. Was going through your article.Had a query. The premium you have mentioned in the example table at the top (is it per month premium ). For ICICI the premium is mentioned to be 15000.So is it per month ? Hi , i wanted to know of any policy from a life insurance co of type (endowment + critical illness cover) . CI as to be part of the policy and not as a rider . Such a policy needs to have a maturity benefit if insured critical illness are never claimed just like a normal endowment policy . Also just a return of premium is also OK .I remember lic had these policies around the year 2002-2005 mentioned in their ready reckoner but they don’t have any such product now . Would appreciate if anyone pointed me to any such product available now . Great Article, as usual ! Would help me to now decide on right product. Could you also help with which is the best home insurance policy. I was struggling to find right product and came to know that following Companies are offering this and m bit confused. It is actually an apt time I’ve seen this article. Thanks Manish and thanks for these comments. 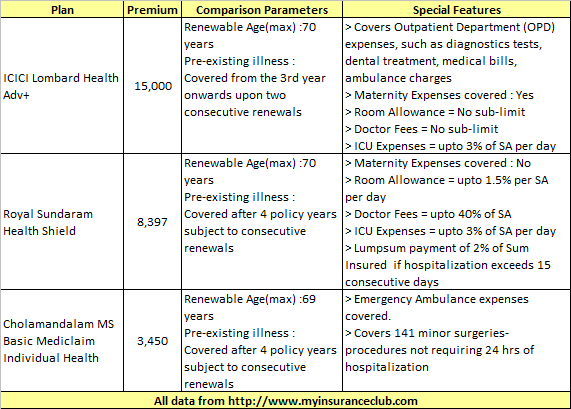 I am looking for 2 Aduilts+1Kid plan and I am comparing few insurance companies. Has anyone compared “Aegon Religare” in the health Insurance side? Aegon Religare’s Health Plan is not actually a MEDICLAIM..It is a health policy which gives you a pre-fixed guaranteed amount in case of hospitalization irrespective of the actual bill..This is kind of wrong in the sense that it will give you guaranteed amount of 1 lakh (cover amount) even if the bill is for Rs 2 lakh..So you stand to pay Rs 1 lakh out of your own pocket..This policy is good if your cover is Rs 1 lakh and your hospital bill is for Rs 70k or 80k..But then, you cannot predict the amount of expenses..Moreover, it covers upto the age of 85 max..So life long clause is not there, in case some policy holder goes on to live for 90 years or more.. Sorry to ask here. What is the difference between MEDICLAIM and health policy. At least point me to a right document/page. Generally we use “mediclaim” and “health insurance policy” for same thing . However in some cases “Mediclaim” works like a pure health cover (just like term insurance) , where you dont get anything at maturity . But there can be policies (concentrate on word “policy” , just like “endowment”) which might have saving element also in them and also covers your medical expenses . Yes i agree there was minor problem for few days because of hospital cheating insurance companies by increasing the hospital charges but that seems to be sorted out. My relative is scheduled for a surgery next week and he has availed cashless facility from National Insurance Co.
@Rakesh – this imbraglio is still very much there and nothing has been sorted out as of date..Various solutions like own TPA by these PSUs, different catagorization of hospitals in catagory A, B, and c etc are going on but the CASHLESS WITHDRAWL AT TOP END HOSPITALs BY PSUs is still there.. Your relative might have got cashless facility from National Insurance but that hospital must not be from MAX, APOLLO, FORTIS, or MEDICITY group.. I hope and prey to GOD that everything goes well and your relative is soon up and running..
As your employer is providing health cover now, go in for a minimum health-cover say of 1 lakh. Later on you can increase it as per your requirment. Go in for PSU, National Insurance Co. is very old and reliable one. Don’t go for private insurance co. blindly, esp. the foreign-indian collaboration co., you might regret it later. And yes, i agree to that extant that dont go for any mediclaim company BLINDLY..but this is valid for both public as well as private…Just compare different plans and select the best one which suits your requirement..there is nothing to fear for in PRIVATE or PUBLIC company.. True that we have to take decision. I am bit confused with one query. i ll be greatful to you if you can give your point of view on that. Currently i am 30 and as i have read premiums for mediclaim is not going to be same as year passing. so defenately at 40 the amount of premium will not be same what i may pay today. Now suppose if i will take decision to go for mediclaim at 40 considering i am having mediclaim providing by employer. What will be difference in this two scenario? Any comments on this is most welcomed. My suggestion, dont wait till age 40 and go for the best plan RIGHT NOW..
Good Information shared here. AT the end what you shold provide some conclusion irerespective of PSUs/Public/Private Sectors. considering having small family includes parents and 2 kids. ( Assuming ). Good, I was so exited while reading the comments and at last every thing is normal…but, “Picture abhi baki hai mere Dost”. I agree with Pattu on choosing PSU for health insurance. I have been with National Insurance Co. for over 3 years and had no problem with claim settlement. Don’t trust private insurance companies atleast when it comes to Health Insurance. 1. You have left out United India Inusrance in your list. Or did http://www.myinsuranceclub.com leave it? I have a mediclaim with them made a couple of claims am pretty satisfied. 2. None of the advantages of online policies stated are really that advantageous. Going to an agent may avoid misselling (may!) but its not a hassle since agents do the dirty work. Why!!? Do you know how many people people from smaller cities come to metro hospitals like the Apollo! If one has the money one should get a higher cover. Everyone gets the same diseases metro or small town! The bottom line is everyone should make an informed decision. 4. I will reiterate what I have said earlier: Unlike life insurance, heath insurance claims are more frequent! Therefore a company cannot afford to pay all claims and will try and avoid. I think many health insurers are not making profit. Which is why I trust only PSUs. Since they also use TPAs I find claim processing pretty efficient. 5. Lifetime renewal: Not sure if this applied to a healthy individual or to everyone. For example consider a 30 year old in perfect health taking such a policy. At 40-45 his health nosedives and he makes 2-3 claims per year. Will the company still guarantee lifetime/ old age renewal! If I was heading a company I wont!! Also remember they gaurantee renewal not same premium. 6. Many companies offer free health checkup. I think this is just a ploy to see how healthy we are and hike up premiums. 7. I would suggest having about 3-4 lakhs as emergency medical fund. So that you if cashless does not work or is not offered you could make a claim later. 5. Agreed 🙂 . Most of the companies will keep loading the premiums after you make the claim , so life time renewal is of now use as they can charge heavy premiums . Yes .. As per IRDA guidelines, the health insurance premiums can be revised based on the latest info , hence based on your last year claims its done ! In the way & reason to increase the premium, Will companies reduce the premium if relatively lesser claims in last year as compared to previous experience ? What IRDA says about this ? Appreciate your comments. I think everything you have mentioned is valid. I like your point 4. I like PSUs too. All data is per the site I used for analysis, nothing is left out. I have mentioned that as a point. Regarding the amount of insurance, I agree with your thoughts on “If one has the money one should get a higher cover”. Do you have any thoughts on the amount for an individual and for a family depending on whether its a tier 1 or tier 2 city ? @PATTU – Quite a fan of PSUs haan?? what to you have to say about sudden withdrawl of cashless facility by them in top-end hospitals and leaving everybody in the lurch?? Majority of the policy holders with them are either delaying their surgeries/treatment or getting them done by paying huge amounts from their own pocket, making a dent in their savings etc..As you yourself has put that many people are coming over from tier 2 and tier 3 cities to DELHI/MUMBAI to get the treatment at these top end hospitals like Apollo, Max, Medicity, Fortis etc..and if they have these PSUs mediclaim policy..what about them dear??? PSUs are not making profit and are incurring losses to the tune of Rs 2000 crore annually is a known fact now and that is why they are doing this crazy stuff of standardizing of the pricing at every hospital, be it a multispecialiy hospital or a nursing home at every nook and corner of the city..and they have failed so far in their efforts to bring these hospitals back to their fold…So its not that PSUs have some huge reserves to swollow losses and continue their functioning..They too are falliable, which is evident..
One more fact which i am sure you must have read in the newspapers or seen in the news that much of the present day WITHDRAWL OF CASHLESS FACILITY muddle has been a creation of TPAs due to which these PSUs are planning to launch their own TPA..(Incidently, in TIMES OF INDIA – 25th August – page 8 – delhi edition -> these existing TPAs have threatened to sue PSUs if they do so)..You can say its a collaboration between PSUs and these TPAs to fleece the innocent public as they never give details as to capping, co-pay, loading etc.. Most of the companies offering renwal till old age limit themselves to age 70-75..But i can say so for my company Max Bupa that we are covering till the policy holder is alive WITHOUT ANY CONCEPT OF LOADING..Check our policy wordings or at our website..This is a standard practice of BUPA (British United Provident Association) in almost 200 countries..Its a new thing in INDIA, for generations brought up on PSUs 😉 so it may sound unreal to them that this is not viable..But believe you me, this is what is going to be the standard practice in the near future…and yes, i can give you the premium chart, from today’s age till age 100+ for HEARTBEAT..So there will be no increase in premium as such..
As per out punchline for Max BUPA, YOUR HEALTH COMES FIRST..so we are more focussed on your health and that is why we are giving free health check ups..One side of the coin is mentioned by you..the other side of the coin, let me tell you, is that if something comes up at your health checkup, you yourself will be in better shape to take care of that illness and how to take preventive measures at the onset to curb that diease..I think it is a good part, right?? 1. I will agree my objectivity is questionable since it is based upon my experiences but so is yours more so since you also have a conflict of interst as a Max Bupa employee. 2. I fully support the (temporary!?) withdrawal of cashless since hospitals misuse cashless to the hilt. I deal with students with medical problems all the time. I can tell you horror stories about how hospitals abuse cashless. Cashless is great for the customer provided hospitals dont abuse it. So dont blame the PSUs/insurers for this. Blame the medical community. Of course instead of suddenly removing it they could have dont it warnings to public and hospitals etc. 3. I am not preaching in favour of PSUs. I state what I think is good for me. It is irrelevant if others find it not incorrect. I am happy with it and thats the only thing that counts for. The idea of this blog is to spread the idea that you should look deeply about what you want and buy/make suitable products/investments. It is not to sell which is what you are indirectly doing. 4. Let me worry about my health thank you. I want my insurerer to provide cashless/claims when I have a genuine health problem. To say some company genuinely cares is naive and I dont think anyone other than employers will believe that! 5. Ultimately my experience is spending first and claiming later has been a better experience for me than cashless. Of course this is not possible by everyone. Which is whay everyone should have a emergency health fund. 3. I am not preaching in favour of PSUs. I state what I think is good for me. It is irrelevant if others find it incorrect. I am happy with it and thats the only thing that counts for me. Good thing that you take good care of your health, but MEDICLAIM is meant only for those times only when something goes wrong..Before that incidence, everybody associated wants the policyholders to be fit and fine.. Nothing personal at all. To each his/her own. Sorry about calling you an employee of Max Bupa. Wish you and Max Bupa well. Good brotherhood and knowledge sharing going on here ..
Dhawal and Pattu take the honours for today. I suspect Manish will compile the comments in a book ! @Dhawal – I went thru Max Bupa Heartbeat policy’s brochure but could not find any clause which guarantees renewal at same premium. Can you pls point me to the relevant place? If true, this is a pathbreaking feature and I would seriously consider taking decent size policies for all members of my joint family. Dear Shailesh, i’ve never said that premium will continue to be same throughout the life time of the policy holder..what i said was GUARANTEE FOR NO LOADING…Price structuring for Max Bupa’s HEARTBEAT is such that premium continues to increase every year unlike sudden increase in other mediclaims where premium is fixed for a bracket age..For eg, in Apollo Munich, the premium under EASY HEALTH PREMIUM for family floater (2 Adults + 1 Child) for SUM ASSURED of 4 lakhs is Rs 25,695 for the age bracket 51 to 60 and then when the same policy holder enters the age bracket 61 to 65, premium jumps to Rs 40,501 (A jump of almost Rs 15,000)..what Max Bupa is doing is that they are increasing the renewal premium every year by say Rs 500 to 700 instead of the jump at one go so that this burden of increase is distributed equally and does not hit the policyholder in this big amount..
With Maxima 360 plan, the premium is same for any age after 60 yrs. The only drawback is you cannot avail higher premium (max 3 lac). The workaround is to take Critical illness (expected after 60 yrs in general) so one can get max 6 lack coverage. Critical illness premium is also fixed. @Karsudha – It is mentioned explicitly in Apollo Munich Broucher that FOR ADDITIONAL COVERAGE OF CRITICAL ILLNESS, THE COVER CEASING AGE IS 70 YEARS & that too for ONLY 8 SPECIFIED CRITICAL ILLNESSES…One more Catch is that they will be giving 10% as no-claim bonus for every claim free year but in any year if you make claim, this cover will reduced by 20%..
Dhawal – Please do send me the chart of Max Bupa you are talking about I too looking to buy a Health Insurance for Self , Wife & twins kids born 4 months back… It will be a great support to me…. I mailed you the email of Dhawal ! Thanks Manish I got it …. & have mailed him regarding my query.. If you are looking for a insurance of 3 lac for your parents, then there are not many policies available. Oriental has sub limits for doctor, room, nursing, ICU etc…..one should not worry about these limits when the parents are admitted to hospital. I did recently take a plan for my parents (individual policies) from Apollo Munich (Maxima 360 health plan and Easy health individual). Max Bupa is also good but they do charge 20% co-pay plus they do not cover Out patient treatment. Go for the company that does not use TPA. Apollo Munich Maxima 360 plan entry age is 65 Yrs. Apolo does support Out patient treatment and covers all day care treatments. I ddi speak to both Apollo and Max call center…I had multiple calls with Max folks as I was interested in that in the beginning but the lack of OPD support and co-pay was made me go to Apollo as they support OPD and no co-pay. Even better is Apollo’s fixed premium for any age after 60 yrs where as Max charges based on age, meaning every year the premium increases. @karsudha – Yes, i checked the broucher and indeed the entry age is 65 years..Correct…but as regards OPD coverage, Apollo Munich says that they will issue ENTITLEMENT CERTIFICATE to avail OPD facility which is same as Max BUPA saying that they will give LOYALTY INCENTIVE VOUCHERS which can be used for OPD..So Apollo Munich is no different in this regards..Moreover, Apollo munich covers daycare treatment of “140” such procedures for which they have issued a list where as Max Bupa says there is no such list and ALL DAYCARE TREATMENTS are covered..
Now the final thing..If you see the price list of Apollo Munich, they have a price segregation according to agewise brackets..They have given examples in their broucher that for 2 adults and 2 child, the premium amount for base product is Rs 30,705 for age bracket of 46-60 and then suddenly when this guy turns 61, his premium is Rs 42,705..So in effect, within one year, he will be paying extra premium of Rs 12,000..What Max BUPA has done is that they have no such brackets and this increase of Rs 12,000 is divided equally in those 15 year period where the policy holder is paying the same amount..And yes, if you check that same broucher carefully, they have a provision of LOADING upto 150%..that means, once diagnosed of any illness, they CAN increase the premium by more than 100%..So if some senior citizen is in tie-up with them, he is more likely to get some illness or the other and he will be put to LOADING factor and his premium will automatically increase..So watch out for this as well..Max BUPA has no clause of LOADING..
All in all, the best two mediclaim options avilable are from Apollo Munich and Max Bupa..
Information on most of the aggregator sites is not updated for months to years. I have tried many of them last month and I found that information is not properly updated or missing. Plus they only sell policies from few insurers. Some important points to check for health insurance are as follow. 1. check if the policy has a co-pay option. This is a good possibility for aged people. 2. Do they charge the premium based on age or do they have fixed for 3/5 years? Again this is relevant for aged people. 3. Take the policy that has “No sub limits”. 4. Spend time to read the “policy wording” document. You would be surprised that many insurers don’t cover all 140+ day care treatment. 5. Look for “life time renewal” or at least up to 75/80 yrs. 6. Check if Critical Illness is covered by default after 4 yrs or you need to go for add on package. 7. For parents, don’t take floater policies…..chances are that both mother and father may need to use it in same year. Go for individual policies. Otherwise also floaters are charged in such a way that all people are going to use the policy in same year. 8. Check if they offer Health checkup every year or every two years. Apollo Munich and Max Bupa are the two finalists in my shoot out and finally I chose Apollo Munich. I am also in process of looking for a suitable Health Insurance for my family (spouse + 2 kids). But along with a Hospitalization cover I also want to include a Critical Illness (CI) cover along with it for family. In my opinion Hospitalization alone is not sufficient and CI cover is also very important. If you take these both type of policies individually, it could be more expensive. I think it is a good idea to combine both. What opinion do you have? I am thinking on which one to go for, as each policy has it’s own pros and cons. My tilt is towards Bharti AXA, as it is covering most CI’s and all day care procedures, although the premium is slightly higher (around Rs. 22K). Any suggestions? I have not covered Max Bupa as they do not offer CI with their Hospitalization plan, which is the case with most of other Insurance providers. All of above Insurers have information on premium for each plan in their websites (except Bharti AXA). Also I had emailed all above insurers on some of my specific questions and only Bharti AXA cared to call me and provided me with more details (within 2 days of email) and Policy wordings and premium information (other 2 insurers had this info available on website for download). I hope this information is useful for others. Also request all readers to provide comments! am 28 years old, am interested to take health insurance to my self and to my parents (father at 51 and my mother at 49) can you please suggest if any online are off line are available. your comments are simple straight and good. that’s way am asking your suggestion. please guide me correctly. This is a very timely article for me. I’m doing some homework on taking a Health Insurance for my family (myself+wife+children+parents), over and above the one that is provided by my current employer. After reading different articles from your site and some other places, it seems to me that I must take a Health Insurance policy ASAP. What I’ve noticed that in family floater most of the complanies are not including parents. Only I’ve got one company that is Oriental who has option of inclusion of parents. I don’t know who are the other companies who gives the option to include parents also. Oprion 2: Single policy that will cover all including parents…. Oriental Happy Family Floater is what I would suggest to you. The amazing thing in this policy is that the primary member on which the premium is based on can be you. What that means is that if the primary member were say someone elder in your family, the premium would be more but if you become the primary member, the premium is less as you are younger – the policy allows that !!. Also, if you note, parents-in-law are also covered under this policy which many policies don’t cover. But in that case , I dont think the premium would be decided just based on the primary policy holder, they must be calculating the premium based on the oldest member of the group . No ? The premium is decided on the primary member and that could be anyone :-). So, the premium is not based on eldest member. Though this is not explicitly mentioned in the prospectus, it could be a grey area – when I bought mine, they followed this rule and it turned out cheaper for me. Worth a deep dive I guess ? Yes, Its worth the look , because it does not make sense from business point of view , Giving health insurance irrespective of oldest age , is same as providing health insurance to some one without considering his nature of job and risks involved with it . There is not 1 but atleast 50 loopholes/drawbacks in this policy..
1. This product is avilable in 2 variants, SILVER & GOLD..Silver policy holders are subjected to 10% co-pay from the begaining..Pathatic..
2. Room rent/boarding/nursing charges are capped at 1% of the SUM ASSURED..That is, if someone has taken cover of Rs 1 lakh, he is entitled for mediclaim of Rs 1,000..Tell me which hospital/nursing home charge Rs 1,000 per day..
3. ICU charges are capped at 2% of the SUM ASSURED..That is, if someone has taken cover of Rs 1 lakh, he is entitled for mediclaim of Rs 2,000..ICU stay, for Rs 2,000 per day??? IMPOSSIBLE..
4. Daily cash allowence is 0.1% of SUM ASSURED for a maximum of 10 days…Please calculate 0.1% of Rs 1 lakh cover on a day basis because i am feeling a bit edgy to do this calculation.. Even if you take 5Lac cover you need pay 10% copay which is absurd. I think a must check website. Just what I was looking for, simple website. Do they have buy option ? What did you buy from it ? What is your profession ?